In SAS, Numeric and Character missing values are represented differently. Sorting Order : dot- underscore is the lowest valued missing value. After the dot-underscore, comes the dot, and then the dot-A. The dot-Z is the highest valued missing value. The MISSING function accepts either a character or numeric variable as the argument and returns the value 1 if the argument contains a missing value or zero otherwise. Character missing values are represented by a single blank enclosed in quotes ' '. Suppose we have a data set containing three variables - X, Y and Z. They all have some missing values. We wish to compute sum of all the variables. NMISS : The NMISS() function will return the number of missing values in the specified list of numeric variables. The NMISS() function will convert any character values to numeric before assessing if the argument value is missing. CMISS : The CMISS() function introduced in SAS 9.2 is similar to the NMISS() function that it counts the number arguments that are missing, but for both character and numeric variables without requiring character values to be converted to numeric. N : The N() function returns the number of non-missing values in a list of numeric variables. SAS provides the statement CALL MISSING() to explicitly initialise or set a variable value to be missing. By default, missing values are excluded and percentages are based on the number of non-missing values. 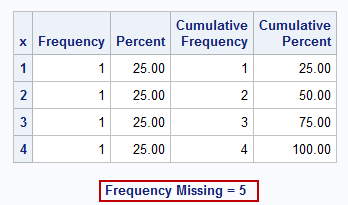 If you use the "/ MISSING" option on the tables statement, the percentages are based on the total number of observations (non-missing and missing) and the percentage of missing values are reported in the table. It produces statistics on non-missing data only. The NMISS option is used to calculate number of missing values. To see number of observations having a missing value for the classification variable, type MISSING option in PROC MEANS. 8 Responses to "Missing Values in SAS"
Thanks a lot! This blog has been very helpful. Thanks, the information was really helpful. I tried this code with the temp data but its not removing any rows. Output is same as the data set. Is it working for any one else ? BrO,Why dont you help in doing the same.Rather then pointing someone,do some good for others as well. Mr.Deepanshu is giving his best for all beginners. I would like to get the variables has to be printed which have couple of missing values. For ex: if the name variable has missing record the name variable should be printed. 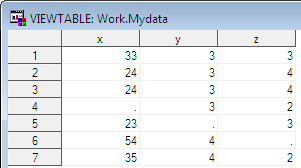 if id variables has a missing record the id variables has to be printed. thanks for the excellent tutorials , please keep datasets and examples in same lesson. it will be helpful for indevedual topic readers.